WHY IT IS NECCESARY TO PARTICIPATE AT EXHIBITIONS? Getting ready to celebrate its 20th anniversary in 2019, Marmara Fair Organization is to bring together the major players of the industry once again in 2019 with the knowledge and experience it has gained at 24 exhibitions and conferences organized under the ISAF brand out of 147 exhibitions in the last 20 years. 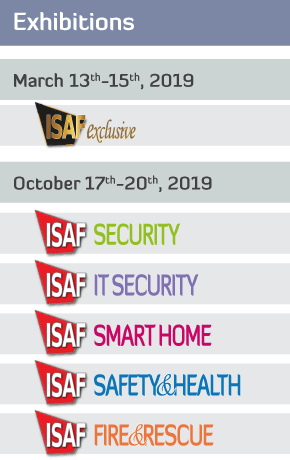 ISAF Exclusive, the most outstanding event in the security sector, is organized in an unusual concept in the event industry. ISAF Exclusive will be held on March 13th-15th, 2019, with the concept of Confex (Conference & Exhibition). The event is ready to bring together the most special companies, names and buyers of the industry with the exhibition section where 40 distinguished and prestigious companies will exhibit their products and with the conference where the most current topics in the industry will be discussed with the participation of leading speakers. Bringing together interconnected and even inseparable sectors such as Security, Cyber Security, Smart Buildings, Fire and Occupational Health and Safety, ISAF is preparing to be held in 2019 with a much stronger content and infrastructure. BIGGEST EXHIBITIONS OF TURKEY IN THEIR SECTORS PREPARE FOR 2019!